The healthcare sector is bursting with opportunity and Merritt College is here to give you what you need to succeed in our ‘Bridge to Healthcare Careers’ program! The ‘Bridge to Healthcare Careers’ program will introduce students to healthcare careers as well as give the skills to succeed in college courses. It is geared toward those 18 and over who have a high school diploma or GED, unemployed or laid off, or are re-entry students, veterans, or those looking to change from a routine job to a professional career. Students also receive case-management style support, lunch, and other services. Full tuition scholarships available with program eligibility! Eligible students can receive additional support through WIOA enrollment. Congratulations are in order for the Nursing Program at Merritt College which was recently ranked the No. 1 RN program in the state by registerednursing.org. The honor is based on the pass rates of the NCLEX-RN exam (National Council of Licensure Examination) which is the standardized exam that is used to license professional nurses in the state. Merritt College, one of the four Peralta Colleges serving the East Bay, is proud to report that its Nursing Program has had an average 99% NCLEX “pass rate” for the past several years. 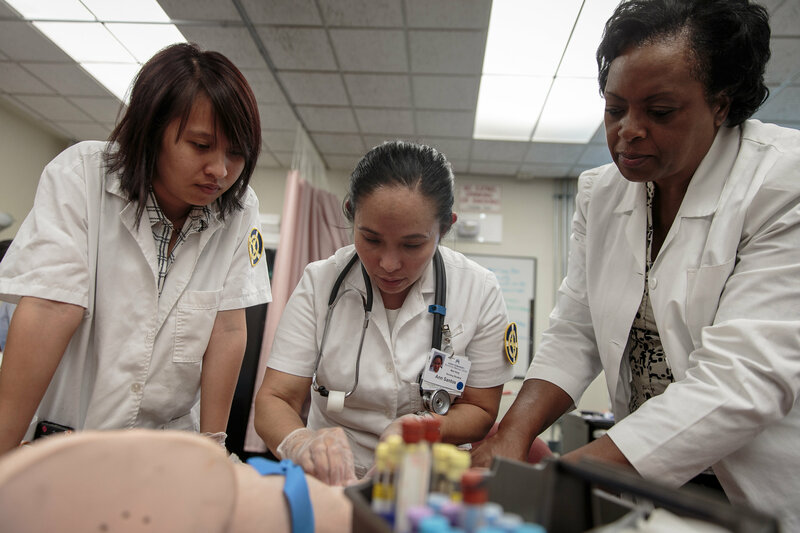 Out of the 126 nursing schools in California, Merritt College was named No. 1 from the top 50 that were ranked. 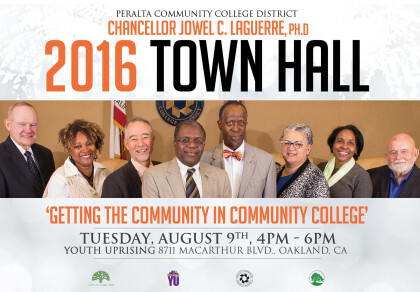 Join Trustee Meredith Brown and Chancellor Jowel C. Laguerre, Ph.D., for a special Town Hall, August 9, 4-6pm at Youth Uprising, 8711 MacArthur Blvd., Oakland. There will be special information for our Community’s students and we will feature some of the special programs at the Peralta Colleges. Information will be available on how you can get into college. Certificate Programs in Apparel Design, Nursing, Computer Information Systems, Manufacturing, Construction, Automotive Repair, and more. Own your future now. Don’t miss this great community event! Exploring Career Pathways at Merritt Kids College. Administration of Justice, Nursing, Biotechnology, Fire Science, Horticulture, Nutrition, Art, Sports and Fun! For more information call Dr. Stacy Thompson at (510) 436-2609. Art * Music * Sports & Fun! 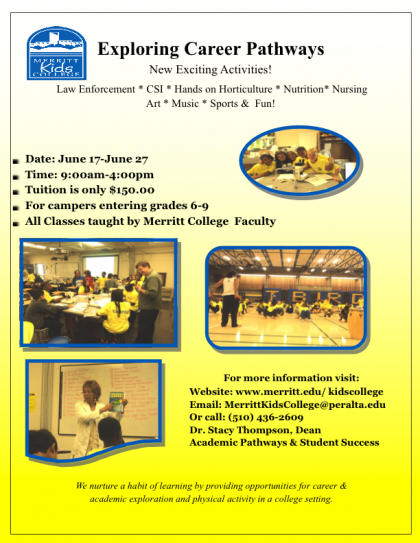 Merritt Kid’s College 2013 – Spaces are limited, Enroll today! Spaces are limited, Enroll today! Merritt Kids College – Career Exploration and Summer Fun! 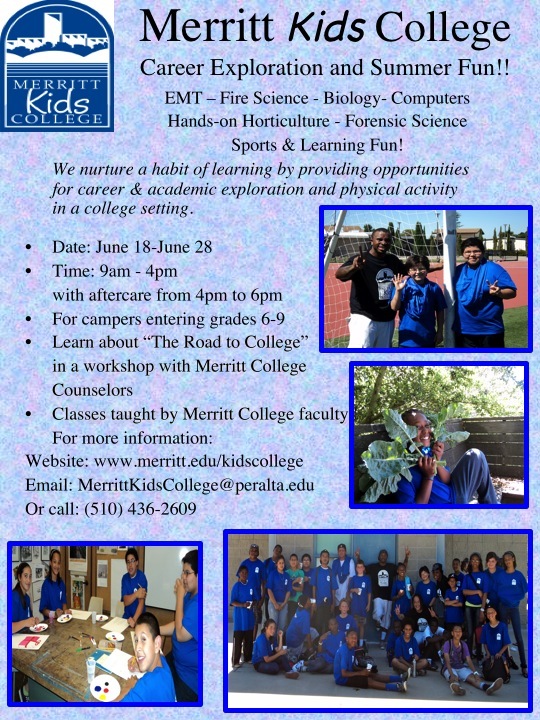 Merritt Kids College is in its 3rd year of offering an affordable Summer Camp experience. 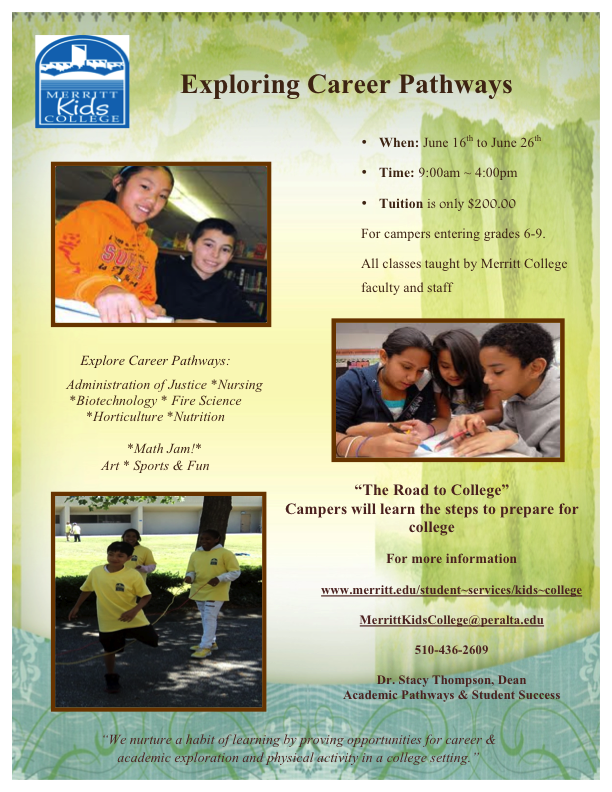 We are located on the Merritt College campus in the month of June for students entering grades 6th – 9th grade. Our mission is to nurture a habit of learning by providing opportunities for career exploration, physical activity and personal growth in a college setting. This summer we will be offering new activities in career exploration such as, Fire Science, Nursing, Administration of Justice and Emergency Medical Technician. Returning activities include Microscopy, Chemistry, Ceramics and much more. Merritt College faculty teaches all classes and presentations are by Merritt College counselors. Our summer session begins June 18th through the 28th for an amazing low price of $150.00. Each day we start at 9am to 4pm with aftercare available from 4pm to 6pm at an additional charge of $15.00 per day. For more information, click here!